The amazing brown top millet ! Sahaja Samrudha (Bengaluru) & Dhanya (Tumkur) have published a book on brown top millet recently (Adbhuta siridhanya korale, Kannada, second edition, 2016, Rs. 60/-). Written by the prolific and ever green Mallikarjun Hosapalya, the first thing that stood out about this book were the many and colorful photographs. Brown top millet (btm) is even lesser known among the already less known small millets. The photographs included in the book helps build a connection between the reader, the millet and the millet farmers at a level that written words cannot. Though, I did flip through the book multiple times looking for two photographs but could not find – an image of the hulled btm rice and a clear photograph of the grains separated from each other so that their full profile can be seen against a contrasting background along with a size bar / ruler to give the reader a visual idea of how small the grains are. Reading the book I was happy to note that it brought to light some lesser known details of btm – for eg. that it grows even in a tamarind tree’s shade. The nutritional profile of btm is another important information that one cannot find easily even on the internet. Given the importance of the nutritional content of these grains and the lack of reliable information online, I looked for more information on the sample collection, preparation and testing of the samples, including the standard scientific protocol followed. Thanks to the publishers and author, unlike many other books, contact information of different people who know about these grains and can provide information about them have been painstakingly put together. I was able to use this information to contact the researchers cited for the nutritional data. I was informed that the full scientific publication is yet to be published and that once done, it would be shared widely – a very justified reason for not publishing it in this book. Quite a few other readers of this book would, I am sure, join me in looking forward to the full scientific publication, in wishing the researchers luck and in offering our support in whatever way possible to further the cause of promoting btm consumption, production and processing. There are two important things that I feel were missed in compiling the book. The first is a matter of geography while the second is a critical aspect in promoting the grain. (1) btm is grown and consumed in reasonable quantity in north central India – the region commonly referred to as Bundelkhand. It is called fikara (ಫಿಕಾರ, फिकार) in the local language and the roti made from these are locally called ‘ghaas ki roti’ or ‘roti made from grass’. When I read about this in the news late last year, this is what caught my attention and I immediately thought, this has to be a millet. Thanks to social media I was able to connect with Ravi Badri working near there. When we received some samples of the grains, we realized that it was indeed a millet and none other than btm. The hardiness of this amazing grain requires no further elaboration when one realizes that these grains had grown in the third successive year of drought in the region ! A quick search online (for urochloa ramosa its current scientific name) reveals that there are published reports of their existence and / or cultivation in Bangladesh; Bhutan; Cambodia; India (Andhra Pradesh, Kerala, Madhya Pradesh, Maharashtra); Malawi; Myanmar; Nepal; Senegal; South Africa; Yemen; Zimbabwe. (2) The other important aspect is a package of practice for the cultivating btm. As highlighted in this book, btm is a prolific plant and it has rightly been pointed out that after one or two seasons of sowing btm seeds, the farmer does not need to sow the field again. Future crops of btm grow with the only effort needed from the farmer being that for harvesting the grains. This is a double edged sword. The hardiness and survival instincts of btm are honed over millennia and are clearly demonstrated in two related characteristics. (i) Each of its nodes, just like its wilder brethren in the grass (poaceae) family, is a source of new roots. As new tillers emerge, the older ones curve out and form a parabolic profile. And as they do so, roots from more and more nodes strike the soil, expanding its resource access, reinvigorating the plant. secondary roots being pushed at even the 4th node in bracharia ramosa (ಕೊರ್ಲು, అండు కొర్ర) at a farm near Kadiri, A.P. as captured in this photograph on 20th Oct 2015. This recurring recharging renders its second amazing characteristic – continued flowering and a continued and extended reproductive phase. (ii) At any point in time, a mature btm plant will have panicles in various stages of maturity. So while the farmer would plan harvesting considering the degree of grain ripening across the field, each of the plants would have shed multiple grains onto the soil seeding their next generation. 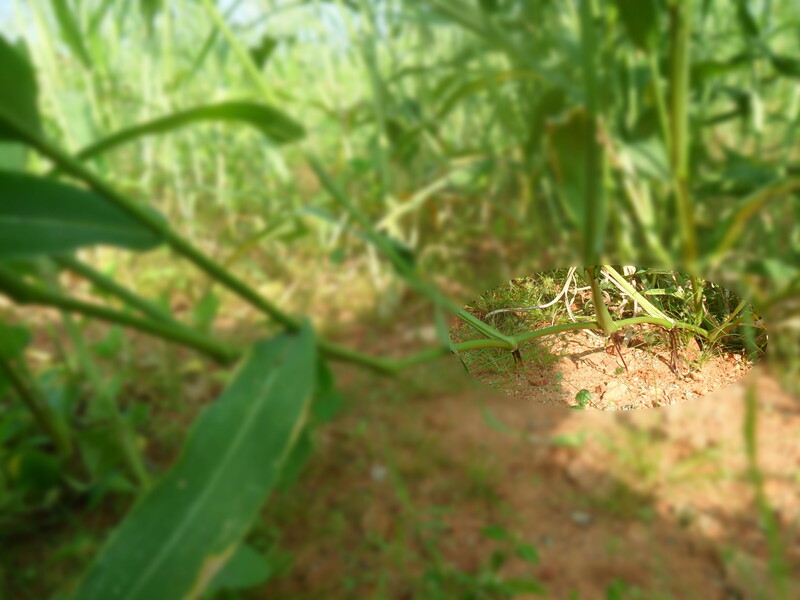 So if necessary on farm practices are not employed from the first season itself, a farmer will start seeing btm as a weed in their land almost from the very next cultivation season. Therefore it is very important to promote btm with a package of practices and necessary trainings and guidance to the farmers where btm cultivation is being introduced. It is very heartening to read about the efforts of some of the new initiatives including that of the youth from Gopalanahalli in Chikkanayakahalli Taluk, Tumkur Dt. of Karnataka. We need more such initiatives and many more such farmers to start making a shift in the way we treat land, farming, ecology and our own nutrition. The publication of this book is among the first steps in the right direction. Given the ongoing farm crisis and the relief that crops such as btm offer, I request the publishers to go for English, Hindi and other regional language translations of this work at the earliest. Those of us who are working on promoting small millets and can read Kannada now have a very useful aid at hand when talking about and promoting btm. Next Next post: Were millets really the staple grains of our ancestors? You are welcome sir ! thank you for writing the book ! A grain that can grow in the third successive years of drought – is amazing and if cultivated with care could be answer to our agragrian crisis! Such a grain on such a barren soil could also be an answer to malnutrition among the rural poor and lifestyle diseases among urban and semi-urban India. Your caution on the right farming practices to ensure that it does not become a weed is also very appropriate. Are there value added products of the grain available in the open market? Would love to read the original book, hope someone translates it into English and Hindi. It would also be great if it can be available in an electronic form so that more of the e-savvy crowd can read it. True. I spoke to Krishna Prasad from sahaja recently and he did mention that they are considering translations. Will convey your request to the folks in Sahaja Samrudha. True Amar ! And yes, like most products from harsh Agro climatic conditions, btm is almost a medicine. But we have to remember that it is also a part of the staple for large sections of society that are already living on the edge of malnutrition and poverty. So while we promote btm and create a market, we have to be vary and take steps to ensure that the producers can still afford to eat it.